Image: IDW. Art by Josh Hood and Jason Lewis. Current events and social issues have always played a part in shaping Star Trek from its earliest days, whether it be the idealistic future of the Federation or using alien races as metaphors for society’s dark side. In Deviations: Star Trek, it’s humanity that’s messed up after the tyrannical Romulans make first contact instead of the Vulcans. A one-off “What If” comic released as part of a larger series of similar comics riffing off other licensed properties at IDW. 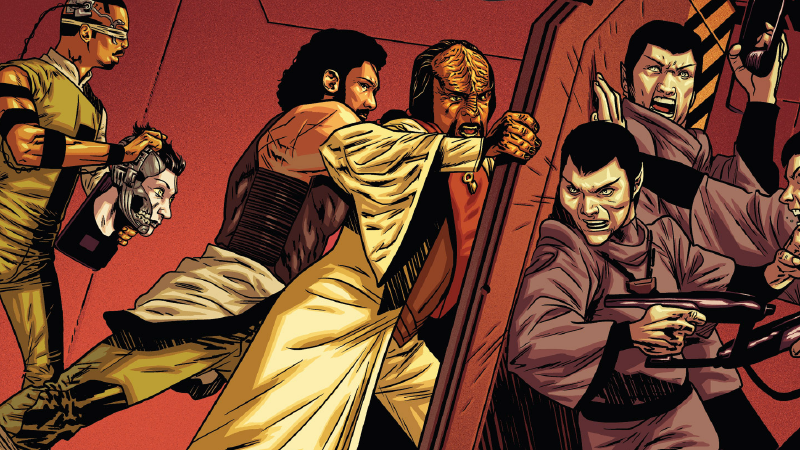 Deviations: Star Trek (written by Donny Cates with art by Josh Hood, Jason Lewis, and AndWorld Design), humanity is conquered and ruled by a secretive, sinister empire, instead of being inspired to create the idealistic, technologically advanced Federation. We sat down with Cates to discuss how he came up with this miserable new reality for Picard, Data, and the others, and why Star Trek’s message of hope is still vital half a century later. io9: Tell us a little bit about the premise of your latest Star Trek story. Were you given the premise of the Romulans being Earth’s first contact, or was that a story you came up with yourself? Cates: [IDW Editor] Sarah Gaydos came to me with a very simple message of “Hey, we want you to do to a Deviations issue. A kind of ‘What if’ for the Trek world. Got any ideas?” and that was it. My first draft of what I wanted to do was insane and we all agreed that we liked the core idea of it, but that we needed to change the “what if” of it all so It made a bit more sense. Humanity is so oppressed by the Romulans in the reality, it almost feels post-apocalyptic. Was the setting did figured out in your head before you started, or did you have an endpoint you wanted to reach and work back from there? Cates: That was all in the original pitch, to be honest. I wanted to open on the [traditional members of the] Federation at their lowest point imaginable. Almost every incarnation we’ve seen of them up until this point we’ve seen a Federation at their pinnacle, at their most advanced. I wanted to take that all away from them. All the ships, and the gear and the science and break it back down to that very human idea of simply wanting a better life. I wanted to see them fight to get back into the stars. There are certainly elements in this story that feel inspired by what’s going on in the world lately. Can you speak on that? Cates: I wrote a little essay in the back of the issue that folks can read if they like, but to summarize it quickly here, I started writing this issue on November 9th, the day after the election. So I was more than a little fired up to talk about certain things. And honestly, I’m so thankful I had a Trek issue in front of me I could say them through. Because holding up a mirror to current events is one of the things, I believe, that had made Star Trek as special as it has all these years. I felt like I had to take this opportunity to express myself and my frustrations in this world. What do you feel is the most important message Star Trek can offer today, 51 years after it first aired? Cates: This goes back to what I was saying that last question. I think, personally, that Trek isn’t a story, or even necessarily science fiction. I think to a lot of us, that it’s a promise, a goal. Something to strive for. Star Wars and many stories like it are about grand evil ruling the galaxy and us overcoming it. Star Trek always begins from a place of “No, we already did that. We got over all the petty stuff and the wars and politics and now look at all this cool stuff we have!” [laughs] It’s a show about ethics and reason, about compassion and exploration. It’s a show that shows us what we could be at our best. Which is why I chose to tell a story about us our worst… fighting like hell to get back to our best. Which, to me anyway, is about as political as it gets right now. Deviations: Star Trek is out today, March 15.